The fresh vegetable and fruit crops vary through the year while the dry goods are fairly consistent. Vegetable-wise, the Summer provides traditional lettuces/greens, a variety of veges and herbs. Fall moves into squashes, roots and heartier greens. Winter provides apples and dried fruit, more roots (storage crops), and thanks to greenhouses and tunnels the fresh leafy greens continue even after the ground freezes. 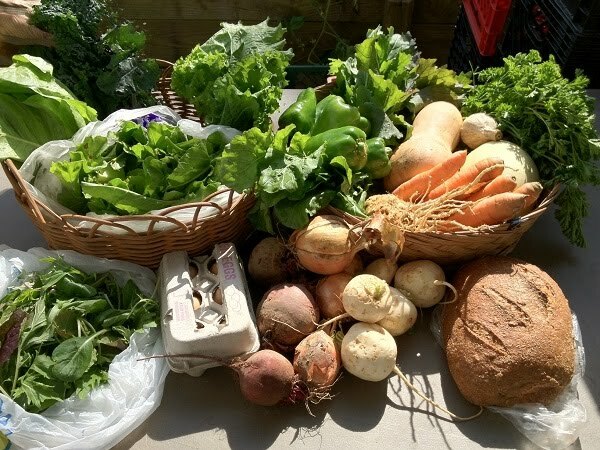 In Spring, locally grown vegetables are just not in nature’s plan although a wide variety of leafy greens, spring onions and garlic may grow abundantly as the weather begins to warm and daylight lengthens. (Spring greens are excellent as March and April are a tradition time of "spring cleaning" our bodies.) Expect Spring and Fall to be the time for abundant greens while Summer and Winter have more of other vegetables. Any thin times are filled in with extra dry goods. The Crop Chart shows what the Kimberton CSA farm has planned for the seasons. Updates are occasionally posted on the member's YAHOO CHAT GROUP and the FACEBOOK page with the weekly share list. The good news is that the Kimberton CSA farm has committed to us for Winter so we are Biodynamic year round! As not every farm can grow everything, we supplement the Kimberton CSA vegetables with other regional favorites such as those listed at the bottom of the crop chart. Fresh fruit varies through the year with a good supply of apples in fall and berries in summer if the bugs and birds don't get to them first. There is less fruit in summer than one would expect until more local, Biodynamic or organic farms surface - this is beginning to happen as demand increases and our CSA is contributing to this. Avocado, mango and meyer lemons are offered as superior health foods from two Biodynamic and organic farms in southern Florida; fresh, unprocessed dates are a favorite. Delicious dried fruit is given when fresh is not available. Grains and legumes are staples to round out a nutritious diet; we offer popular ones according to member surveys e.g. brown rice, quinoa, rolled oats, lentils, chick peas, black beans, white beans. Some very special items are offered as available to introduce members to them and to support those providers as well. Usually included in spring when there is less fresh food.